We tested Ge(Li) and Si(Li) detectors made by ORTEC (A nearby prominent Oak Ridge Co.) for nuclear physics and nuclear medicine applications. The XRF system was jointly developed and used a 2 cm diameter Ge(Li) detector. Yhe detector was surrounded by a Pb shield containing 20, 1 Ci Am-241 60 KeV sources arrayed around the periphery of the lead collimator.The geometry was different from the device developed by Kevex for the same purpose. 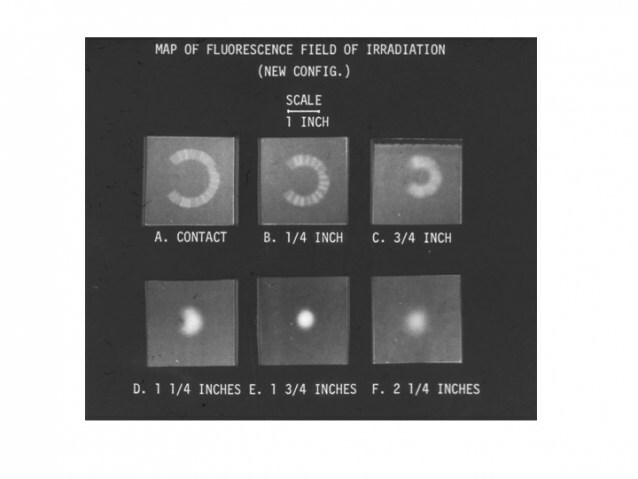 The source-emitted photons that passed through the front opening focussed so that each of the sources irradiated a common region in the gland. The XRF detector and source shield was side mounted on the upper shield of the 8” dual opposed Ohio Nuclear scanner we used for routine clinical imaging tasks. The source and detector assembly moved in a rectilinear raster, step wise exciting iodine x-rays from the different regions in the gland. The computer stored the GeLi detected characteristic iodine x-rays induced when the 60 keV Am-241 photons were incident on the gland at successive coordinate positions. The excited Ka and Kb X-rays from the gland in the 28-30 keV energy region that passed through a hole in the center of the source-containing shield and hit the detector were stored in memory. 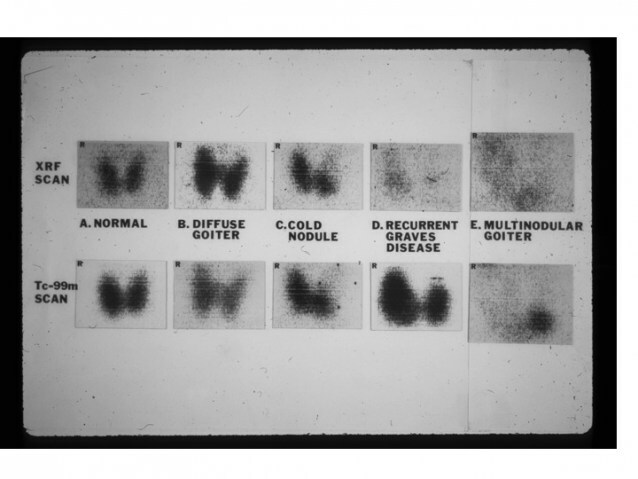 The counts were recorded in an x-y grid and counts were transformed into thyroid iodine content using stored calibration data. The calibration data compensated for differential geometrical efficiency (based on the size and depth of the gland in relation to the distance to the dectector) and for attenuation of both the incident and excident radiations. The focal spot of the system was located 1 3/4 inches in front of the collimated source as noted on film images made at different distances. 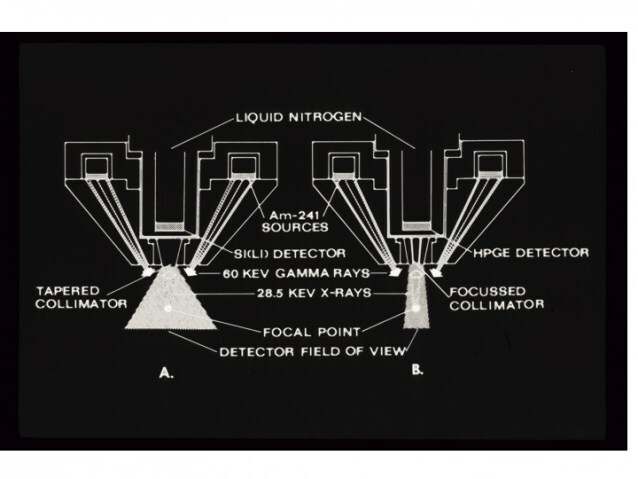 → Depth of focus of XRF Device: Source design and manufacture was accomplished in collaboration with Neal Case and the Isotope Division at ORNL. Because of the high radiation toxicity of Am-241 (if taken into the body), stringent radiation protection codes required the sources be doubly encapsulated in stainless steel containers. The 60 keV x-ray emissions are attenuated in two ways, first in passing through the high density Am source itself (self attenuation), and then in passing through the tissues in the neck overlying the thyroid, and finally by passing through the thyroid itself. To minimize self absorption in the source, the Am-241 was tightly pressed into thin sources each of were stored in one of the 20 sopurce holders arrayed around the periphery of the collimator. 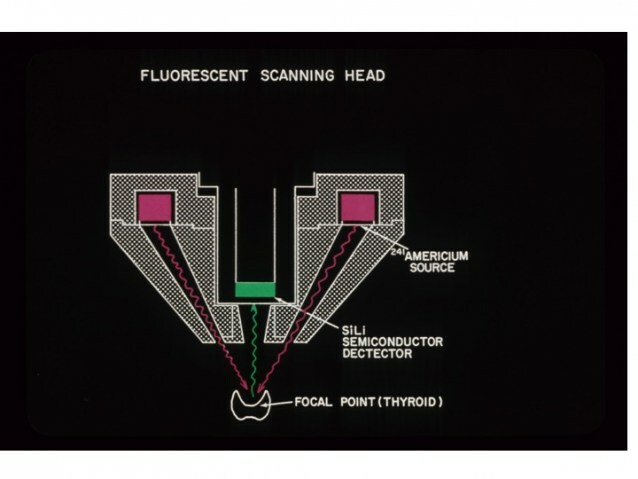 Note the film illustration of the focal point at 1 3/4 inches from the face of the collimator. The device moved over the patient’s neck and recorded the emissions of the 28 keV K-alpha, and K-beta lines from stable iodine ( I-127) in the gland. Calibration factors were developed by imaging known amounts of iodine in sources embedded in different amounts of paraffin at different depths and air gaps, and these factors were used to transform iodine x-ray counts into iodine content in the gland. Newer methods using ultrasound to determine the 3D volume of thyroid gland promise to improve the calibration process. Si(Li) detectors were also evaluated for use in our XRF and transmission imaging studies. 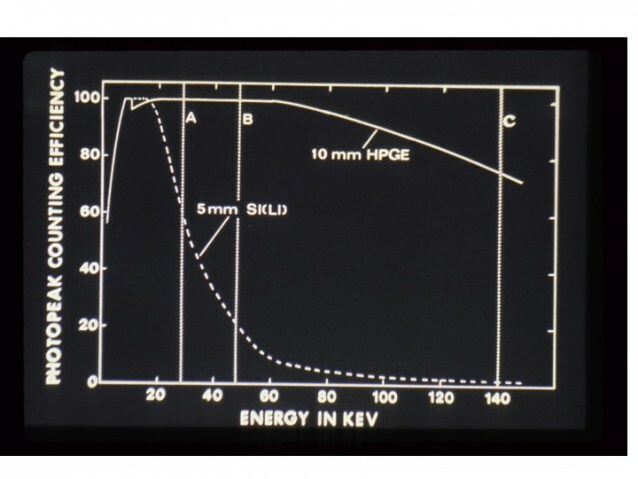 They had better energy resolution than Ge(Li), but the stopping power of Si falls off steeply above 30 KeV which limits their use to low energy imaging. This was fine for XRF and for transmission studies using I-125 sources, but not for imaging most gamma rays of medical interest. The Ge(Li) detector on the other hand could be used effectively for XRF AND for imaging higher energy tracers. An additional advantage of Ge(Li) was the ability to separate close gamma ray lines, allowing for simultaneous imaging of 2 high energy tracers, including 140 keV Tc-99m and 159-keV I-123 which has many potential uses but could not be imaged with the Anger Camera. → Tc-99m Scans with HPGe: The advent of High Purity Germanium (HPGe) simplified logistic support issues. Liquid nitrogen is needed to cool both types of detectors during operations. But, when lithium drifted detectors warm to room temperature, if liquid nitrogen is depleted in the cryostat, the detectors have to be reconditioned (Li re drifted) by the manufacturer before they can be used again. The use of HPGe avoids this problem. Further development of solid state area detectors now make it possible to resolve BOTH energy and position of events. 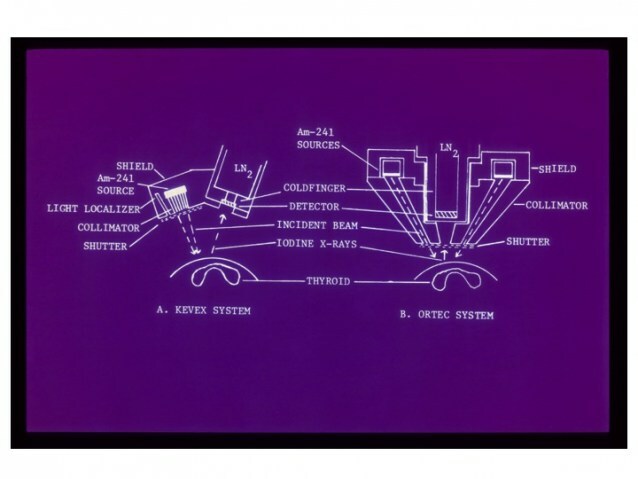 Orthogonal strip dual sided Si, and Ge detectors came into use in the 1990s and promise to be important for imaging low (Si) and Hi (Ge) energies with x,y event position including depth information at clinically useful data rates. Todd Peterson and VUIIS are evaluating position sensitive Ge and Si detectors for imaging purposes.